Charity organizations need good coverage, it means going online. You're going to need an accessible website for that. 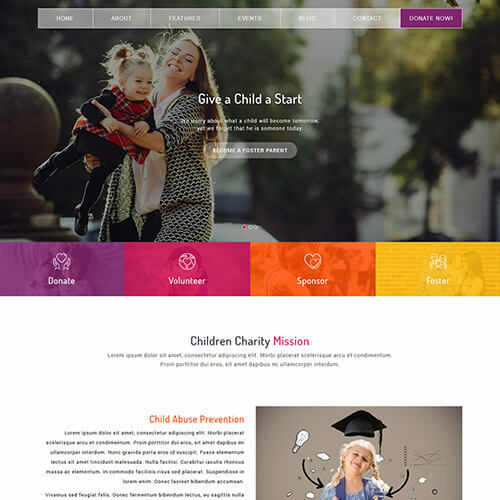 All templates for best charity HTML5 CSS3 website template are responsive so that any other charity groups can view your website through any browser, even on their mobile phones. These NGO Charity html5 website templates on ThemeVault comes with eye-candy layout, expressive typography, visual elements, full-screen sliders, beautifully designed donation section, people's testimonials, latest news & events block, cross-browser compatibility, newsletter subscription and so on. Templates can be customised according to your needs and ideas. All the templates are carefully structured with clean and modern design and fully responsive along with essential and extra features. Set up your very own charity templates and enjoy 100% customer satisfaction.